On April 30th, I attended a performance of the famous Japanese Noh play, The Feathered Mantle (Hagoromo) at Willamette University's M. Lee Pelton Theatre in Salem, Oregon. 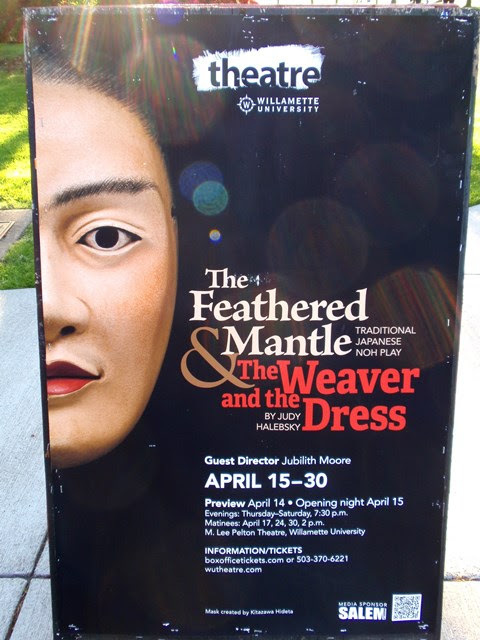 This was my first opportunity to see Noh in my home state and my first visit the beautiful campus at Willamette University. This was also the first Japanese theater performance my mother has attended with me, making the event even more special. 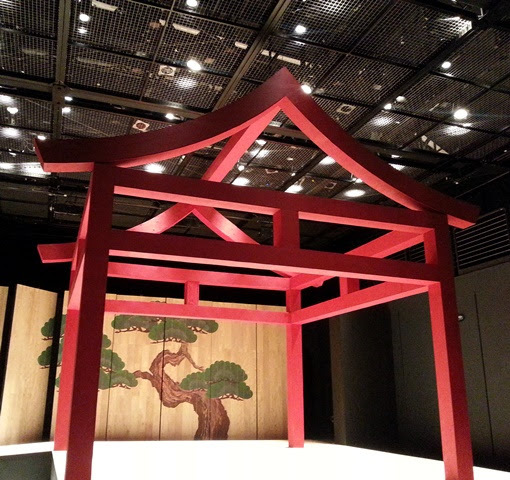 The stage held most of the elements of a traditional Noh theater. The kagami-ita (panels at the back of the stage) displayed a background of pine trees and cleverly rotated to reveal mist and clouds during the finale. The actors passed along a hashigakari (bridge) from the backstage area hidden by a colorful agemaku curtain to the main stage (hon-butai). 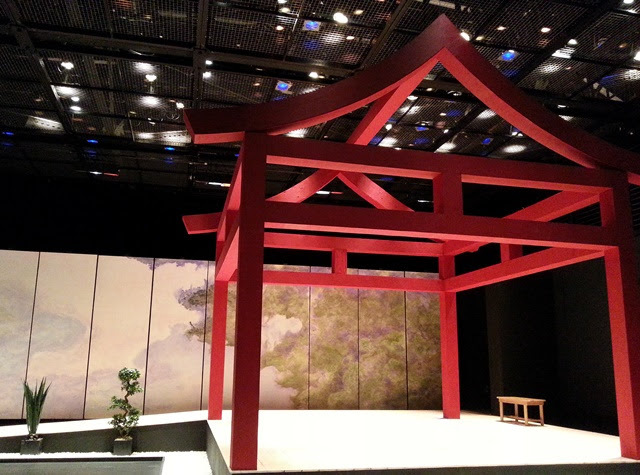 The boldly colored pillars (bashira) at the four corners of the main stage acted as marks for the main actor (shite) whose vision would be extremely limited by the Noh mask. Hagoromo takes place in a pine grove along the Miho coastline. Here, a fisherman named Hakuryou finds a feathered robe hanging from the bough of a pine tree. As he prepares to leave with the robe, a celestial maiden (tennin) appears to reclaim it. She pleads with Hakuryou who is initially reluctant to give up the robe, explaining that without it she would be trapped on earth, losing her immortal status and unable to return to her place in the heavens. The fisherman is moved by her words and agrees to return the robe if she will agree to perform a celestial dance. At first, he insists on holding onto the robe until after the dance, believing that the maiden would leave immediately without fulfilling her promise. She explains that she cannot perform the dance without the robe and that celestial beings would never practice this kind of deceit. Hakuryou is convinced to return her robe and she performs a dance called Suruga-mai, describing the Palace of the Moon and the beauty of the Miho-no-Matsubara (Miho pine grove). As the dance comes to a conclusion, the celestial maiden fades into the mist beyond Mount Fuji. 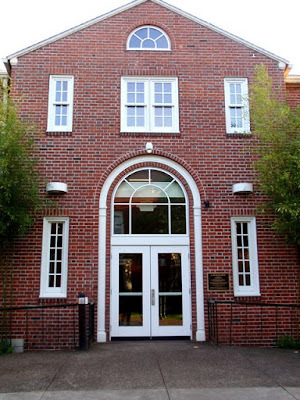 The play was adapted for English by Richard Emmert. 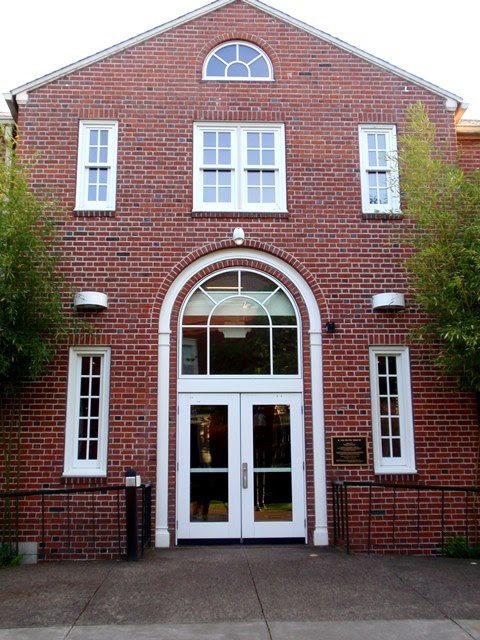 According to the program, the students in Willamette University's Theatre Department had just five weeks to study and rehearse. I was very impressed with the entire production from the set design to the skilled performance by the actors and musicians.